Some of the Troy mayoral candidates are weighing in on law and order after two police officers were wounded in a fatal shootout with a carjacking suspect over the weekend in Lansingburgh. According to the Troy Police Department, officers Chad Klein and Joshua Comitale were responding to a report of a carjacking late Saturday. The incident happened in the area of 112th Street and 5th Avenue. Comitale was shot in both of his lower legs. Klein was shot in the shoulder at close range. Both were admitted to Albany Medical Center. Comitale underwent surgery Sunday morning. The suspect, identified as 39-year-old Thaddeus Faison of Albany, died of gunshot wounds after police returned fire. The Times Union, citing "an official familiar with the case," says Officer Klein was expected to be released from the hospital on Tuesday. Friends and family of Faison have reportedly accused Troy Police of murder. They are also distraught at the removal of a makeshift memorial set up in Faison's memory. Such memorials are common for gunshot victims in Albany, where police generally leave them in place up to 30 days. Mayoral candidate Ernest Everett — one of several looking to replace Lou Rosamilia, who is not seeking another term — is quite familiar with the neighborhood where the shootout took place. "It actually occurred right on the same corner where I was born and raise. It definitely hits home." The Democrat calls it a shameful tragedy, and shows a lack of respect for the police officers involved and for the city that sounds an alarm of its own. "We need to start getting together, coming up with different programs, and weeding out these bad characters that are holding our city back. That's the true way that Troy is going to move forward. That's why public safety has to be my number one priority but also the number one priority of Troy." Fellow Democrat Rodney Wiltshire is also running for mayor, but addresses the shooting as council president. "This is a very isolated incident. It is random in the notion that Troy, as a far as robberies are concerned, does not have a high number of hijacking and those types of events. The perpetrator and suspect in this case came from Albany. We don't have the autopsy results yet, or at least I don’t have them yet, but he probably was on drugs and they were in his system and he was committing a crime and he had a violent felony past and he was a parolee and violating his parole and he was carrying a handgun, which is completely illegal and obviously he was intent on using that handgun if he needed to, if he felt he did , and he did." Wiltshire commended police and says he completely supports the force and Chief John Tedesco. "And if the police chief has any idea on what he may wanna beef up patrols for increased safety if he feels anything needs to be done and we will respond in kind with him and make sure he has the support of the city and the council in order to do such things. However, he believes this is a very isolated incident and we're safer now than we were before Saturday." Jim Gordon is a councilman for the area of the shooting, which lies within his district, and a GOP mayoral candidate. "Quite frankly, enough is enough. How much more can our communities endure before we come together regionally, collectively, to approach these issues. It's hard to hold people accountable and tackle them one by one. We can no longer do it on our own. We need to do it in a concise manner as a regional team, focused on gangs, focused on just the career criminal element. We know who the people are, we know where they are, but we can no longer push them form one municipality to another. We need to work together as a team to rid our streets of this. We can no longer endure what we've been enduring for the last two years. Arsons and stabbings and shootings. Murder. Blood on our streets in Troy. Neighbors don't need to live in terror, and that's what they're facing right now." 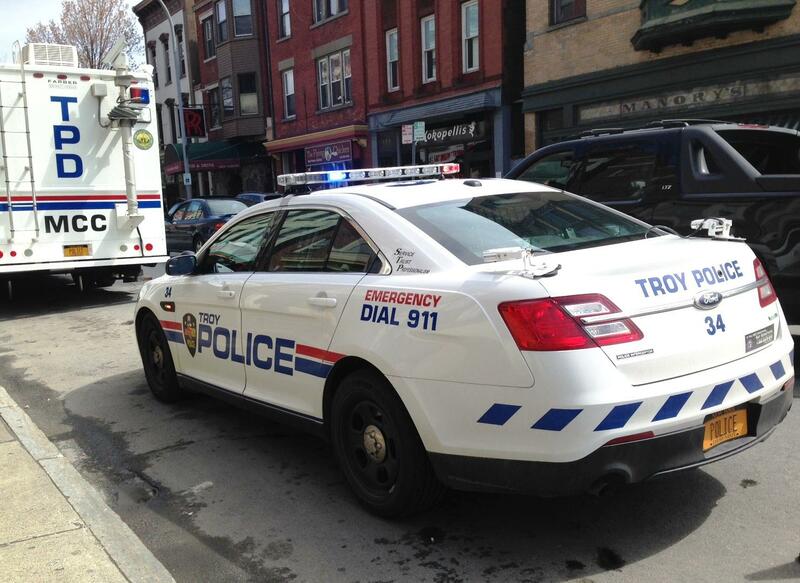 Troy police did not immediately respond to calls for comment Tuesday. With Mayor Lou Rosamilia deciding not to seek another term, the political scene in Troy is wide-open ahead of the fall elections. 32-year-old native Ernest Everett would like to see his beloved Troy make a big comeback. The Democrat announced his candidacy in Lansingburgh in the spring and believes he is the one who can unify the Collar City. Everett sat down with WAMC's Capital Region Bureau Chief Dave Lucas to discuss his platform. Troy Councilman Jim Gordon is formally announcing his candidacy for mayor today, joining a crowded field of hopefuls looking to replace the retiring Democrat Lou Rosamilia. Gordon spoke with WAMC's Capital Region Bureau Chief Dave Lucas. When Troy Mayor Lou Rosamilia announced Monday that he would not seek re-election, a window of opportunity opened for a cast of mayoral hopefuls. City Council President Rodney Wiltshire was first to officially step forward. Wiltshire kicked off his mayoral campaign Wednesday. Considered a "rebel" Democrat by some, Wiltshire often has clashed with first-term Mayor Lou Rosamilia and party leaders. Troy Mayor Lou Rosamilia has announced he will not seek re-election in the fall. Potential candidates were already waiting in the wings — now that Rosamilia's officially out of the race, WAMC takes a closer look at Troy politics.